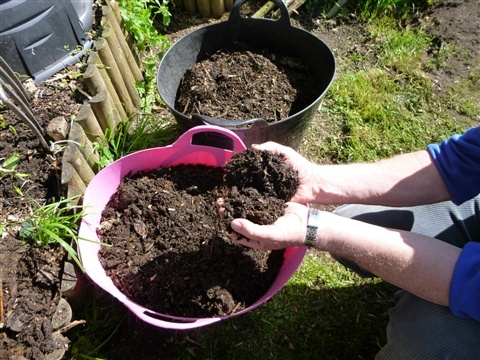 Compost is an excellent soil improver and can be used to increase the organic matter in the soil. In temperate climates such as the UK organic material may consist of 50% organic matter in tropical and subtropical climates it may only make up 1% of the soil content. In such climates compost or other organic material needs to be added to the soil more frequently than in the UK (annually) as without frosts soil activity continues throughout the year with the result that organic material is used continually. Compost makes an excellent soil improver and wil,l over the years, make the soil easier to work and lead to a better soil structure to the benefit of both plants and those digging. This being the case it is understandable that the most common use of home produced compost is surface mulch. This allows the use of unfinished (non-matured) compost avoiding the need to store it through the maturation stage. The compost can be spread over the flower or vegetable bed in the autumn and left for the worms to take it down into the soil. A clear area, free from mulch, of about 2-3", should be left round the plant stems. If unfinished compost in which the decomposition process is not completed is dug into the soil immediately before planting this may result in stress to the plants and a yellowing of the leaves and stalled growth. Shewell-Cooper in Compost Gardening (David & Charles 1974) recommend the use of compost in no dig, or minimum dig, gardening where it is spread on the ground surface as a mulch about an inch deep and leaving it for the worms to take it into the soil. It can be spread across the vegetable garden, herbaceous border, fruit patch, shrub border, rose bed in fact across the whole garden. This should prevent the growth of annual weeds, and once the perennials have been removed, save much time that would have been spent hoeing. The compost spreading is best on the garden in the spring put it can be done at any time of year. 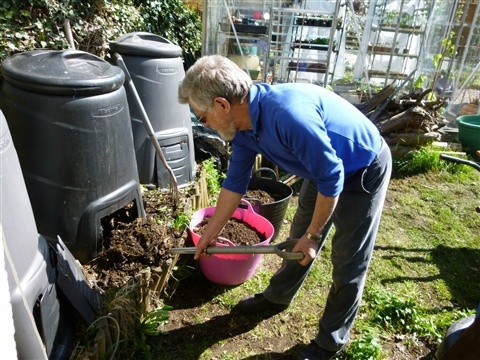 It is suggested that the compost is topped up annually for the next four years by adding about a 1/4inch of compost to replace that carried down into the soil by the worms. After that time, it is only necessary to add more compost when the soil becomes visible through that already spread. It can be used in a minimum dig seedbed by spreading at a rate of five bucketfuls per square yard and forking it into the top two inches of soil. As an Alterative to a surface mutch it can be spread and then dug in. On sandy soils compost mulch soil improver is spread over the soil to form a one inch layer and then dug into the soil to just over half the length of the blade of a digging spade (6-8 inches) On Clay soils the quantity should be doubled. This will need supplementing with a nitrogen fertiliser. Vegetable Gardens. The "dug in" variation of the surface mulch is favoured by many vegetable gardeners when the mulch is spread and then dig it into the soil in the autumn before planting in the spring or early summer. Digging in will bring the nutrients and humus into the root zone of the plants. The amount of compost to be used will vary, first and foremost depending on how much you have been able to produce, but also on the use of that area of the garden. 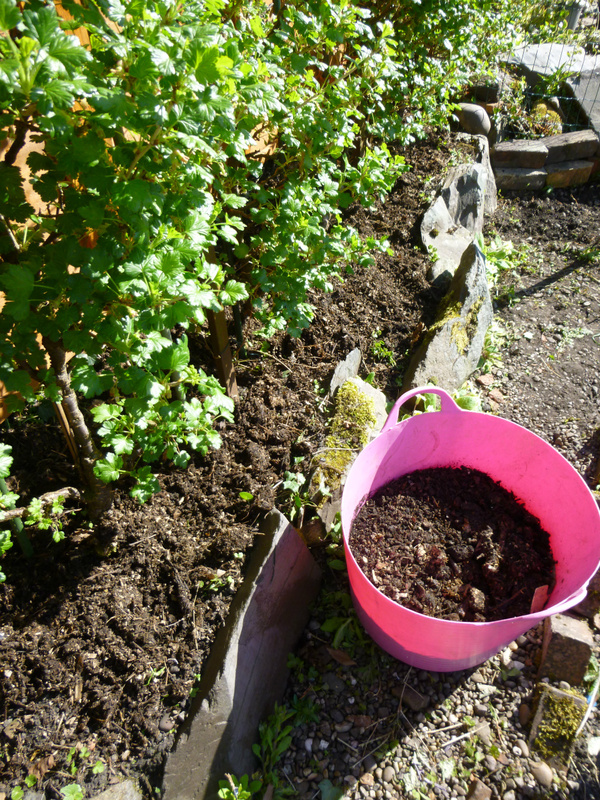 The general recommendation is a wheelbarrow load spread over five square metres for before planting the more greedy plants such as brassicas, potatoes, tomatoes and black currants. Over wintering brassicas will also benefit from summer mulch. Other, less hungry, fruit can be mulched every four or five years. 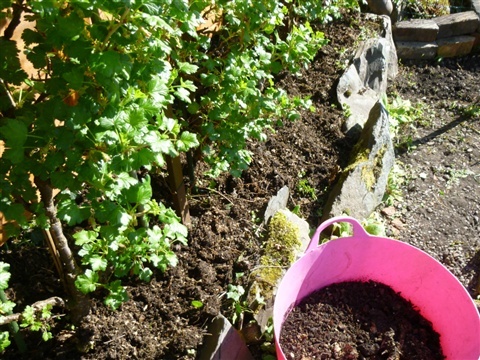 Parsley will also benefit from compost mulch. If an open compost heap or bin is used it is common to grow courgettes and swashes directly on the compost heap. This does mean that it cannot be harvested until the autumn but that is no hardship compared with the benefits. It also means that you can grow courgettes, marrows and squashes in a relatively small garden without making a permanent vegetable plot. Flower Beds The compost can be applied as a mulch and left on the surface where digging in would damage roots or bulbs. Trees Used as a mulch round established trees compost can provide essential to a soil which otherwise may be neglected. A top dressing of compost is often applied to the lawn in the autumn. However, the value of more frequent but lighter applications of compost as a top dressing is now being recognised. If adopting this routine of treatment, the first treatment is best applied early in spring when the lawn will be receiving less footfall, reducing the likelihood of compost being carried indoors. It and can be repeated every month where the lawn is used regularly. It is best to sieve or break up the compost as smaller particles can drop between the blades of grass and become incorporated into the soil easily. It is best applied it dry. If you have filled your compost heap/bin with as much grass as it can handle and do not want to send grass cuttings to the Council composting site (now that many Councils charge for providing a garden waste collection) you can leave your cut grass on the lawn. Cut the grass when it is not more than 4” long setting the mowing height at about 3". Apparently, the grass clippings can provide about a third of the nutrients that the lawn will need for healthy growth so you will also save on the cost of lawn fertiliser. Pamela J. Sherratt, Sports Turf Specialist, Department of Horticulture and Crop Science, The Ohio State University. http://ohioline.osu.edu/hyg-fact/1000/1190.html. Wikipedia suggests that when preparing a raised bed compost can be mixed with various materials such as clay, sand, and even aged sawdust, and to make the soil mix. The compost should not exceed more than 30 percent of the total mix. A good quality matured compost should be used rather than the unmatured compost that can be used as a mulch. with plants. In a container garden, as in bedding mixes, compost may be a beneficial ingredient in the potting media. It is again used to provide up to 30 percent of the total mix. It is considered a partial substitute for peat moss, but generally lacks the porosity and water-holding capacity of peat so must be used in limited percentages. The nutrient content of compost can also reduce the need for supplemental chemical fertilizers, although this has to be determined in each situation. The Lasagne gardening technique can provide an economic way to fill a raised bed provided you are prepared to wait a year for the composting process to be completed before growing in the bed. A raised bed can be purchased or homemade. If homemade I would suggest that the bed is made about two-foot-high and six or eight foot by four. If it is to make gardening easier for a well chair user a height can be chosen to provide easy access from the chair. In areas where the raised bed is being used because the soil is contaminated a layer of good quality landscape fabric should be spread over the soil to stop roots from down below the level of the compost mix into the contaminated the soil. Cover the landscape fabric with a good layer of cardboard and add a three- or four-inch drainage layer of twigs about one to one and a half inches long (chopping these is time consuming but worthwhile) If autumn leaves are available (either fresh or from a recent leaf mould bag) add a six- or eight-inch layer over the twigs. Soak the leaves well. This layer of Browns is followed by a layer of Greens , which in turn is followed by a layer of Browns with the alterative layers being continued until the bed is filled. For this lower level of Greens, it is often suggested that half the layer consists of two inches of well-rotted manure. Compost can be used as an alternative to the manure if necessary. This is followed by a four-inch layer of grass clippings or other garden waste, uncooked kitchen vegetable waste supplemented with coffee grounds if available. Making an eight-inch layer of Greens. This layer is covered by an eight-inch layer of Browns e.g. saved autumn leaves, straw, cardboard or paper. Then start all over again, layering brown materials and greens, until the bed is full. Water once more and leave it to decompose over the winter. Finished home produced garden compost can be used as a component in homemade potting and seed composts. Used correctly it makes excellent potting compost providing good water retention and some nutrients. IWhen taking classes I normally make seedballs in groups of 16 – 20 children with each child making three balls if they are paying to participate and making the bombs to take away at the end of the session. However, if the plan is to seed bomb a school garden each student may only make one bomb and the bombing will take place in small teams with each team bombing a marked off section of the garden. When the seeds have germinated the students can see how effective they have been in covering the whole of the target area. The seedballs can put, dropped or thrown onto the area being seeded. If thrown these flour seedballs are more likely to breakup on impact with the soil than those coated in clay and are best thrown immediately after a shower or when rain is expected.